Welcome to BitBeat, your daily dose of crypto current events, written by Paul Vigna and Michael J. Casey. - When Mt. Gox first brought up the issue of “transaction malleability,” the cause of its latest strife, the general response was that it was trying to shift the blame. Then the software glitch became a Trojan Horse for hackers, and all the other major exchanges were subjected to the same undermining attacks. We can imagine the exchange’s team having a chuckle at that. They scored a victory, of sorts. But it’s been of the Pyrrhic variety. 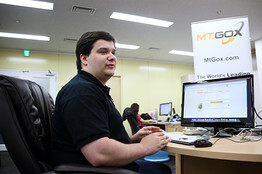 Mark Karpeles, Tibanne CEO, in the office. In an update to customers on Monday, the bitcoin exchange said it’s got a workaround in place, and it expects to resume withdrawals “soon.” That’s not likely to mollify already agitated customers, especially when rival exchange Bitstamp has already fixed its problem and resumed service on Saturday. Mt. Gox’s customers have existential questions about the exchange, as detailed by our colleagues Takashi Mochizuki and Eleanor Warnock in Toyko. This isn’t exactly a new issue for Mt. Gox, which was in a similar place last summer when it was forced to halt withdrawals for a time. These shutdowns aren’t aided by the fact that the company is notoriously tight-lipped (it still hasn’t replied to BitBeat’s request for comment). The combination engenders distrust, something that isn’t good for any exchange, whether it’s dealing in stocks, cows, or bitcoin. Journalists: Mt Gox price currently only real-time market on probability Mt Gox is solvent. Currently more than 2:1 against. Mr. Polemitis stressed to BitBeat that he didn’t know whether or not Mt. Gox was solvent. The point, he said, was that currently (until it changes) customers can’t get their money out of the exchange, and the difference between the price on Mt. Gox and other exchanges represents a bet. “The price reflects the market price, times some probability you’ll ever be able to take [bitcoin] out,” Mr. Polemitis said. Roughly speaking, if people are willing to take $300 (or less) for bitcoin on Mt. Gox, they’re pricing in a 50% chance they’ll never get that money. “It might be panic, it might not be well-thought out, but it’s a market,” he said. Lastly, there’s a petition circulating around, asking the Bitcoin Foundation to dump Mark Karpeles, the CEO of Mt. Gox’s parent company, Tibanne, from the foundation’s board. It currently has about 500 signatures. - Bitcoin has been steadily if slowly attracting more attention on Wall Street. Analysts at Citi and J.P. Morgan have penned research notes, and we got one today from Wedbush, a securities firm based in California that traces its roots back to 1955. But what was almost as interesting as the note itself was this: Wedbush is selling the note on its website, and accepting payment via bitcoin. “We are now open for business with virtual currency,” the firm wrote on its site. The arrangement is unusual in at least two respects: First is the bitcoin angle, of course, but also, we can’t recall ever seeing another firm selling its research directly online (it’s selling only the bitcoin-related research). There are a couple of websites that specialize in IPO data and reports that sell their material online, as Jay Ritter of the University of Florida pointed out to us, but there aren’t any other full-service financial firms doing so. The most recent report, by the firm’s Gil Luria and Aaron Turner, advised investors to pay attention to news on bitcoin’s innovation front, rather than the price. “We believe bitcoin has made strides toward mainstream institutionalization as large retailers and content creators have begun incorporating bitcoin,” they write. - Once upon a time, before the Internet and social media, before television and radio, the way themes and messages traveled through the culture was essentially through music, through wandering troubadours and sheet music. Think about the story of John Henry, a railroad worker who famously (maybe) took on a steam hammer in a race to build the railroads, at a time when workers were being replaced by machines. So we were taken with a song we heard over the weekend that combines both the old-time culture-bearing job of music with bitcoin. “Ode to Satoshi” is a bluegrass-style song with an old-timey feel that mixes references to Satoshi Nakamoto and blockchains (and, ahem, “the fall of old Mt. Gox”) with mandolin-picking and harmonicas. Part Pete Seeger and part Andreas Antonopoulos (the song is dedicated to both), it was written and performed by John Barrett, who hosts a podcast called “Bitcoins and Gravy“ out of East Nashville, Tennessee. Lij Shaw, who co-hosts the podcast, engineered the song. The podcast was Mr. Shaw’s idea (the name “Bitcoins and Gravy” was inspired from a song Mr. Shaw did with a band called Eleanor Roosevelt), and is an offshoot of the “Let’s Talk Bitcoin” podcast (of which Mr. Antonopoulos is a co-host). The Tennesseans are part of a pilot program, which includes airing the podcast on KCAA radio in Loma Linda, Calif.